As soon as Topps heard that the Miami Heat was closing in on a deal to bring Shaquille O'Neal back to Florida, it was in its graphics room making some big changes. Topps is pleased to announce that Shaq's first card featuring him in his all-new black Miami Heat threads will be included in the upcoming 2004-2005 Topps Basketball being released nation-wide on August 16th. 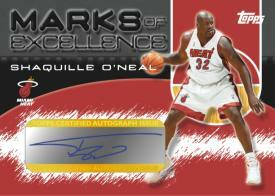 And best of all, the card will be personally autographed by Shaq himself. The card will be randomly inserted into packs. Shaq's non-autographed card will feature him as a Laker. Each 10-card pack carries a $1.59 SRP. Source: The Topps Company, Inc.